I have been doing a lot of research on currency pegs, and I haven't had time to do a full length blog entry. I did, however, make this chart. Tomorrow I will write a longer entry on the implications of the chart above and respond to recent comments. I really enjoy your analysis and commentary, however, please proof read your work. "Tomorrow I will be write a longer entry on the implications..."
it will only serve to lend credibility to your work. Thank you from the bottom of my heart. keep on keeping on. I removed the extra "be". 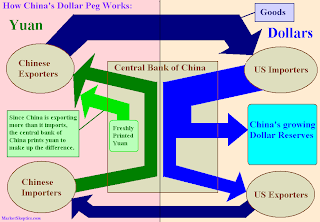 "Tomorrow I will write a longer entry on the implications..."
This chart helps understand the flow of money.